For other uses, see Tulip (disambiguation). Tulips (Tulipa) form a genus of spring-blooming perennial herbaceous bulbiferous geophytes (having bulbs as storage organs). The flowers are usually large, showy and brightly coloured, generally red, pink, yellow, or white (usually in warm colours). They often have a different coloured blotch at the base of the tepals (petals and sepals, collectively), internally. Because of a degree of variability within the populations, and a long history of cultivation, classification has been complex and controversial. The tulip is a member of the Liliaceae (lily) family, along with 14 other genera, where it is most closely related to Amana, Erythronium and Gagea in the tribe Lilieae. There are about 75 species, and these are divided among four subgenera. The name "tulip" is thought to be derived from a Persian word for turban, which it may have been thought to resemble. Tulips originally were found in a band stretching from Southern Europe to Central Asia, but since the seventeenth century have become widely naturalised and cultivated (see map). In their natural state they are adapted to steppes and mountainous areas with temperate climates. Flowering in the spring, they become dormant in the summer once the flowers and leaves die back, emerging above ground as a shoot from the underground bulb in early spring. While tulips had probably been cultivated in Asia from the tenth century, they did not come to the attention of the West until the sixteenth century, when Western diplomats to the Ottoman court observed and reported on them. They were rapidly introduced into Europe and became a frenzied commodity during Tulip mania. Tulips were frequently depicted in Dutch Golden Age paintings, and have become associated with the Netherlands, the major producer for world markets, ever since. In the seventeenth century Netherlands, during the time of the Tulip mania, an infection of tulip bulbs by the tulip breaking virus created variegated patterns in the tulip flowers that were much admired and valued. While truly broken tulips do not exist anymore, the closest available specimens today are part of the group known as the Rembrandts – so named because Rembrandt painted some of the most admired breaks of his time. Tulipa (tulips) is a genus of spring-blooming perennial herbaceous bulbiferous geophytes, dying back after flowering to an underground storage bulb. Depending on the species, tulip plants can be between 4 inches (10 cm) and 28 inches (71 cm) high. Flowers: The tulip's flowers are usually large and are actinomorphic (radially symmetric) and hermaphrodite (contain both male (androecium) and female (gynoecium) characteristics), generally erect, or more rarely pendulous, and are arranged more usually as a single terminal flower, or when pluriflor as two to three (e.g. Tulipa turkestanica), but up to four, flowers on the end of a floriferous stem (scape), which is single arising from amongst the basal leaf rosette. In structure, the flower is generally cup or star shaped. As with other members of Liliaceae the perianth is undifferentiated (perigonium) and biseriate (two whorled), formed from six free (i.e. apotepalous) caducous tepals arranged into two separate whorls of three parts (trimerous) each. The two whorls represent three petals and three sepals, but are termed tepals because they are nearly identical. The tepals are usually petaloid (petal like), being brightly coloured, but each whorl may be different, or have different coloured blotches at their bases, forming darker colouration on the interior surface. The inner petals have a small, delicate cleft at the top, while the sturdier outer ones form uninterrupted ovals. Tulip flowers come in a wide variety of colours, except pure blue (several tulips with "blue" in the name have a faint violet hue), and have absent nectaries. Tulip flowers are generally bereft of scent and are the coolest of floral characters. The dutch regarded this lack of scent as a virtue, as it demonstrat the flowers chasteness. Androecium: The flowers have six distinct, basifixed introrse stamens arranged in two whorls of three, which vary in length and may be glabrous or hairy. The filaments are shorter than the tepals, and dilated towards their base. Gynoecium: The style is short or absent and each stigma has three distinct lobes, and the ovaries are superior, with three chambers. Fruit: The tulip's fruit is a globose or ellipsoid capsule with a leathery covering and an ellipsoid to globe shape. Each capsule contains numerous flat, disc-shaped seeds in two rows per chamber. These light to dark brown seeds have very thin seed coats and endosperm that does not normally fill the entire seed. Leaves: Tulip stems have few leaves. Larger species tend to have multiple leaves. Plants typically have two to six leaves, some species up to 12. The tulip's leaf is cauline (born on a stem), strap-shaped, with a waxy coating, and the leaves are alternate (alternately arranged on the stem), diminishing in size the further up the stem. These fleshy blades are often bluish-green in colour.The bulbs are truncated basally and elongated towards the apex. They are covered by a protective tunic (tunicate) which can be glabrous or hairy inside. Tulipanin is an anthocyanin found in tulips. It is the 3-rutinoside of delphinidin. The chemical compounds named tuliposides and tulipalins can also be found in tulips and are responsible for allergies. Tulipalin A, or α-methylene-γ-butyrolactone, is a common allergen, generated by hydrolysis of the glucoside tuliposide A. It induces a dermatitis that is mostly occupational and affects tulip bulb sorters and florists who cut the stems and leaves. Tulipanin A and B are toxic to horses, cats and dogs. The color of a tulip is formed from two pigments working in concert; a base color that is always yellow or white, and a second laid-on anthocyanin color. The mix of these two hues determines the visible unitary color. The breaking of flowers occurs when a virus suppresses anthocyanin and the base color is exposed as a streak. Tulipa is a genus of the Liliaceae (lily) family, once one of the largest family of monocots, but which molecular phylogenetics has shown to be a much smaller discrete family with only 15 genera. Within Liliaceae, Tulipa is placed within Lilioideae, one of three subfamilies, with two tribes. Tribe Lilieae includes seven other genera in addition to Tulipa. The genus, which includes about 75 species, is divided into four subgenera. The word tulip, first mentioned in western Europe in or around 1554 and seemingly derived from the "Turkish Letters" of diplomat Ogier Ghiselin de Busbecq, first appeared in English as tulipa or tulipant, entering the language by way of French: tulipe and its obsolete form tulipan or by way of Modern Latin tulīpa, from Ottoman Turkish tülbend ("muslin" or "gauze"), and may be ultimately derived from the Persian: دلبند‎ delband ("Turban"), this name being applied because of a perceived resemblance of the shape of a tulip flower to that of a turban. This may have been due to a translation error in early times, when it was fashionable in the Ottoman Empire to wear tulips on turbans. The translator possibly confused the flower for the turban. Tulips are mainly distributed along a band corresponding to Latitude 40o north, from south-east of Europe (Ukraine, Russia) and Turkey in the west, through the Levant (Syria, Israel, Palestinian Territories, Lebanon and Jordan) and the Sinai Peninsula. From there it extends eastwards through Jerevan, (Armenia) and Baku (Azerbaijan) and on the eastern shore of the Caspian Sea through Turkmenistan, Bukhara, Samarkand and Tashkent (Uzbekistan), to the eastern end of the range in the Pamir-Alai and Tien-Shan mountains in Central Asia, which form the centre of diversity. Further to the east, Tulipa is found in the western Himalayas, southern Siberia, inner Mongolia, and as far as the northwest of China. While authorities have stated that no tulips west of the Balkans are native, subsequent identification of Tulipa sylvestris subsp. australis as a native of the Iberian peninsula and adjacent North Africa shows that this may be a simplification. In addition to these regions in the west tulips have been identified in Greece, Cyprus and the Balkans. In the south, Iran marks its furthest extent, while the northern limit is the Ukraine. Although tulips are also throughout most of the Mediterranean and Europe, these regions do not form part of the natural distribution. Tulips were brought to Europe by travelers and merchants from Anatolia and Central Asia for cultivation, from where they escaped and naturalised (see map). For instance, less than a half of those species found in Turkey are actually native. These have been referred to as neo-tulipae. Tulips are indigenous to mountainous areas with temperate climates, where they are a common element of steppe and winter-rain Mediterranean vegetation. They thrive in climates with long, cool springs and dry summers. Tulips are most commonly found in meadows, steppes and chaparral, but also introduced in fields, orchards, roadsides and abandoned gardens. Botrytis tulipae is a major fungal disease affecting tulips, causing cell death and eventually the rotting of the plant. Other pathogens include anthracnose, bacterial soft rot, blight caused by Sclerotium rolfsii, bulb nematodes, other rots including blue molds, black molds and mushy rot. The fungus Trichoderma viride can infect tulips, producing dried leaf tips and reduced growth, although symptoms are usually mild and only present on bulbs growing in glasshouses. Variegated tulips admired during the Dutch tulipomania gained their delicately feathered patterns from an infection with the tulip breaking virus, a mosaic virus that was carried by the green peach aphid, Myzus persicae. While the virus produces fantastically streaked flowers, it also weakens plants and reduces the number of offsets produced. Dutch growers would go to extraordinary lengths during tulipomania to make tulips break, borrowing alchemists’ techniques and resorting to sprinkling paint powders of the desired hue or pigeon droppings onto flower roots. Tulips affected by mosaic virus are called "broken"; while such plants can occasionally revert to a plain or solid colouring, they will remain infected and have to be destroyed. Today the virus is almost eradicated from tulip growers' fields. The multicoloured patterns of modern varieties result from breeding; they normally have solid, un-feathered borders between the colours. Tulip growth is also dependent on temperature conditions. Slightly germinated plants show greater growth if subjected to a period of cool dormancy, known as vernalisation. Furthermore, although flower development is induced at warmer temperatures (20–25 °C), elongation of the flower stalk and proper flowering is dependent on an extended period of low temperature (<10 °C). Tulip bulbs imported to warm-winter areas are often planted in autumn to be treated as annuals. The colour of tulip flowers also vary with growing conditions. Cultivation of the tulip began in Persia, probably in the 10th century. Early cultivars must have emerged from hybridisation in gardens from wild collected plants, which were then favoured, possibly due to flower size or growth vigour. The tulip is not mentioned by any writer from antiquity, therefore it seems probable that tulips were introduced into Anatolia only with the advance of the Seljuks. In the Ottoman Empire, numerous types of tulips were cultivated and bred, and today, 14 species can still be found in Turkey. Tulips are mentioned by Omar Kayam and Jalāl ad-Dīn Rûmi.Species of tulips in Turkey typically come in red, less commonly in white or yellow. 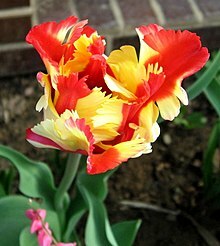 The Ottoman Turks had discovered that these wild tulips were great changelings, freely hybridizing (though it takes 7 years to show color) but also subject to mutations that produced spontaneous changes in form and color. A paper by Arthur Baker reports that in 1574, Sultan Selim II ordered the Kadi of A‘azāz in Syria to send him 50,000 tulip bulbs. However, John Harvey points out several problems with this source, and there is also the possibility that tulips and hyacinth (sümbüll), originally Indian spikenard (Nardostachys jatamansi) have been confused. Sultan Selim also imported 300,000 bulbs of Kefe Lale (also known as Cafe-Lale, from the medieval name Kaffa, probably Tulipa schrenkii) from Kefe in Crimea, for his gardens in the Topkapı Sarayı in Istanbul. It is also reported that shortly after arriving in Constantinople in 1554, Ogier Ghislain de Busbecq, ambassador of the Austrian Hapsburgs to the court of Suleyman the Magnificent, claimed to have introduced the tulip to Europe by sending a consignment of bulbs west. The fact that the tulip's first official trip west took it from one court to the other could have contributed to its ascendency. Sultan Ahmet III maintained famous tulip gardens in the summer highland pastures (Yayla) at Spil Dağı above the town of Manisa. They seem to have consisted of wild tulips. However, from the 14 tulip species known from Turkey, only four are considered to be of local origin, so wild tulips from Iran and Central Asia may have been brought into Turkey during the Seljuk and especially Ottoman periods. Sultan Ahmet also imported domestic tulip bulbs from the Netherlands. The gardening book Revnak'ı Bostan (Beauty of the Garden) by Sahibül Reis ülhaç Ibrahim Ibn ülhaç Mehmet, written in 1660 does not mention the tulip at all, but contains advice on growing hyacinths and lilies. However, there is considerable confusion of terminology, and tulips may have been subsumed under hyacinth, a mistake several European botanists were to perpetuate. In 1515, the scholar Qasim from Herat in contrast had identified both wild and garden tulips (lale) as anemones (shaqayq al-nu'man), but described the crown imperial as laleh kakli. In a Turkic text written before 1495, the Chagatay Husayn Bayqarah mentions tulips (lale). Babur, the founder of the Mughal Empire, also names tulips in the Baburnama. He may actually have introduced them from Afghanistan to the plains of India, as he did with other plants like melons and grapes. In Moorish Andalus, a "Makedonian bulb" (basal al-maqdunis) or "bucket-Narcissus" (naryis qadusi) was cultivated as an ornamental plant in gardens. It was supposed to have come from Alexandria and may have been Tulipa sylvestris, but the identification is not wholly secure. Although it is unknown who first brought the tulip to Northwestern Europe, the most widely accepted story is that it was Oghier Ghislain de Busbecq, an ambassador for Emperor Ferdinand I to Suleyman the Magnificent. According to a letter, he saw "an abundance of flowers everywhere; Narcissus, hyacinths and those in Turkish called Lale, much to our astonishment because it was almost midwinter, a season unfriendly to flowers." However, in 1559, an account by Conrad Gessner describes tulips flowering in Augsburg, Swabia in the garden of Councillor Heinrich Herwart. In Central and Northern Europe, tulip bulbs are generally removed from the ground in June and must be replanted by September for the winter. It is doubtful that Busbecq could have had the tulip bulbs harvested, shipped to Germany and replanted between March 1558 and Gessner's description the following year. Pietro Andrea Mattioli illustrated a tulip in 1565 but identified it as a narcissus. Carolus Clusius is largely responsible for the spread of tulip bulbs in the final years of the sixteenth century. He planted tulips at the Vienna Imperial Botanical Gardens in 1573. He finished the first major work on tulips in 1592, and made note of the variations in colour. After he was appointed director of the Leiden University's newly established Hortus Botanicus, he planted both a teaching garden and his private garden with tulips in late 1593. Thus, 1594 is considered the date of the tulip's first flowering in the Netherlands, despite reports of the cultivation of tulips in private gardens in Antwerp and Amsterdam two or three decades earlier. These tulips at Leiden would eventually lead to both the Tulip mania and the tulip industry in the Netherlands. Over two raids, in 1596 and in 1598, more than one hundred bulbs were stolen from his garden. Tulips spread rapidly across Europe and more opulent varieties such as double tulips were already known in Europe by the early 17th century. These curiosities fitted well in an age when natural oddities were cherished and especially in the Netherlands, France, Germany and England, where the spice trade with the East Indies had made many people wealthy. Nouveaux riches seeking wealthy displays embraced the exotic plant market, especially in the Low Countries where gardens had become fashionable. A craze for bulbs soon grew in France, where in the early 17th century, entire properties were exchanged as payment for a single tulip bulb. The value of the flower gave it a special ‘aura’ of mystique, and numerous publications describing varieties in lavish garden manuals were published, cashing in on the value of the flower. An export business was built up in France, supplying Dutch, Flemish, German and English buyers. The trade drifted slowly from the French to the Dutch and is thought to have sparked the infamous tulip mania in Holland. Between 1634 and 1637, the enthusiasm for the new flowers in Holland triggered a speculative frenzy now known as the tulip mania that eventually led to the collapse of the market three years later. Tulip bulbs had become so expensive that they were treated as a form of currency, or rather, as futures, forcing the Dutch government to introduce trading restrictions on the bulbs. Around this time, the ceramic tulipiere was devised for the display of cut flowers stem by stem. Vases and bouquets, usually including tulips, often appeared in Dutch still-life painting. To this day, tulips are associated with the Netherlands, and the cultivated forms of the tulip are often called "Dutch tulips." The Netherlands have the world's largest permanent display of tulips at the Keukenhof. The majority of tulip cultivars are classified in the taxon Tulipa ×gesneriana. They have usually several species in their direct background, but most have been derived from Tulipa suaveolens (today often regarded as synonym with Tulipa schrenkii). Tulipa ×gesneriana is in itself an early hybrid of complex origin and is probably not the same taxon as was described by Conrad Gessner in the 16th century. It is believed the first tulips in the United States were grown near Spring Pond at the Fay Estate in Lynn and Salem, Massachusetts. From 1847 to 1865, Richard Sullivan Fay, Esq., one of Lynn's wealthiest men, settled on 500 acres (2.0 km2) located partly in present-day Lynn and partly in present-day Salem. Mr. Fay imported many different trees and plants from all parts of the world and planted them among the meadows of the Fay Estate. The Netherlands are the world's main producer of commercial tulip plants, producing as many as 3 billion bulbs annually, the majority for export. Tulips can be propagated through bulb offsets, seeds or micropropagation. Offsets and tissue culture methods are means of asexual propagation for producing genetic clones of the parent plant, which maintains cultivar genetic integrity. Seeds are most often used to propagate species and subspecies or to create new hybrids. Many tulip species can cross-pollinate with each other, and when wild tulip populations overlap geographically with other tulip species or subspecies, they often hybridise and create mixed populations. Most commercial tulip cultivars are complex hybrids, and often sterile. Offsets require a year or more of growth before plants are large enough to flower. Tulips grown from seeds often need five to eight years before plants are of flowering size. To prevent cross pollination, increase the growth rate of bulbs and increase the vigor and size of offsets, the flower and stems of a field of commercial tulips are usually topped using large tractor-mounted mowing heads. 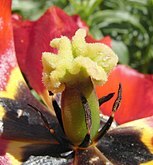 The same goals can be achieved by a private gardener by clipping the stem and flower of an individual specimen. Commercial growers usually harvest the tulip bulbs in late summer and grade them into sizes; bulbs large enough to flower are sorted and sold, while smaller bulbs are sorted into sizes and replanted for sale in the future. Because of the fact that tulip bulbs don’t reliably come back every year, tulip varieties that fall out of favor with present aesthetic values have traditionally gone extinct. Unlike other flowers that do not suffer this same limitation, the Tulip’s historical forms do not survive alongside their modern incarnations. In horticulture, tulips are divided into fifteen groups (Divisions) mostly based on flower morphology and plant size. Div. 1: Single early – with cup-shaped single flowers, no larger than 8 cm across (3 inches). They bloom early to mid season. Growing 15 to 45 cm tall. Div. 2: Double early – with fully double flowers, bowl shaped to 8 cm across. Plants typically grow from 30–40 cm tall. Div. 3: Triumph – single, cup shaped flowers up to 6 cm wide. Plants grow 35–60 cm tall and bloom mid to late season. Div. 4: Darwin hybrid – single flowers are ovoid in shape and up to 8 cm wide. Plants grow 50–70 cm tall and bloom mid to late season. This group should not be confused with older Darwin tulips, which belong in the Single Late Group below. Div. 5: Single late – cup or goblet-shaped flowers up to 8 cm wide, some plants produce multi-flowering stems. Plants grow 45–75 cm tall and bloom late season. Div. 6: Lily-flowered – the flowers possess a distinct narrow 'waist' with pointed and reflexed petals. Previously included with the old Darwins, only becoming a group in their own right in 1958. Div. 7: Fringed (Crispa) – cup or goblet-shaped blossoms edged with spiked or crystal-like fringes, sometimes called “tulips for touch” because of the temptation to “test” the fringes to see if they are real or made of glass. Perennials with a tendency to naturalize in woodland areas, growing 45–65 cm tall and blooming in late season. Div. 11: Double late – Large, heavy blooms. They range from 18 to 22 inches tall. Div. 12: Kaufmanniana – Waterlily tulip. Medium-large creamy yellow flowers marked red on the outside and yellow at the center. Stems 6 in. tall. Div. 14: Greigii – Scarlet flowers 6 in. across, on 10 in. stems. Foliage mottled with brown. Div. 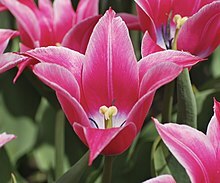 15: Species or Botanical – The terms "species tulips" and "botanical tulips" refer to wild species in contrast to hybridised varieties. As a group they have been described as being less ostentatious but more reliably vigorous as they age. Div. 16: Multiflowering – not an official division, these tulips belong in the first 15 divisions but are often listed separately because they have multiple blooms per bulb. A number of names are based on naturalised garden tulips, and are usually referred to as neo-tulipae. These are often difficult to trace back to their original cultivar, and in some cases have been occurring in the wild for many centuries. The history of naturalisation is unknown, but populations are usually associated with agricultural practices and are possibly linked to saffron cultivation[clarification needed] . Some neo-tulipae have been brought into cultivation, and are often offered as botanical tulips. These cultivated plants can be classified into two Cultivar Groups: 'Grengiolensis Group', with picotee tepals, and the 'Didieri Group' with unicolourous tepals. Tulip bulb planting depth 6 inches/15 cm. Tulip bulbs are typically planted around late summer and fall, in well-drained soils. Tulips should be planted 4 to 6 inches (10 to 15 cm) apart from each other. The recommended hole depth is 4 to 8 inches (10 to 20 cm) deep, and is measured from the top of the bulb to the surface. Therefore, larger tulip bulbs would require deeper holes. Species tulips are normally planted deeper. The tulip was a topic for Persian poets from the thirteenth century. In the poem Gulistan by Musharrifu'd-din Saadi, described a visionary garden paradise with "The murmur of a cool stream / bird song, ripe fruit in plenty / bright multicoloured tulips and fragrant roses..." In recent times, tulips have featured in the poems of Simin Behbahani. Tulips are called lale in Turkish (from Persian: "laleh" لاله). When written in Arabic letters, "lale" has the same letters as Allah, which is why the flower became a holy symbol. It was also associated with the House of Osman, resulting in tulips being widely used in decorative motifs on tiles, mosques, fabrics, crockery, etc. in the Ottoman Empire. The tulip was seen as a symbol of abundance and indulgence. The era during which the Ottoman Empire was wealthiest is often called the Tulip era or Lale Devri in Turkish. The shape of emblem of Iran is chosen to resemble a tulip, in memory of the people who died for Iran. According to Iranian folklore, when a martyr dies, a red tulip grows from where he has fallen. Tulips became popular garden plants in east and west, but, whereas the tulip in Turkish culture was a symbol of paradise on earth and had almost a divine status, in the Netherlands it represented the briefness of life. The Black Tulip is a historical romance by Alexandre Dumas, père. The story takes place in the Dutch city of Haarlem, where a reward is offered to the first grower who can produce a truly black tulip. 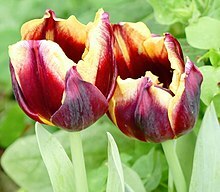 While tulips can be bred to display a wide variety of colors, black tulips have historically been difficult to achieve. The Queen of the Night tulip is as close to black as a flower gets, though it is in fact a dark and glossy maroonish purple - nonetheless an effect prized by the Dutch. The first truly black tulip was bred in 1986 by a dutch flower grower in Bovenkarspel, Netherlands. The specimen was created by cross-breeding two deep purple tulips, the Queen of the Night and Wienerwald tulips. The Semper Augustus was the most expensive tulip during tulip mania. “The color is white, with Carmine on a blue base, and with an unbroken flame right to the top” – wrote Nicolas van Wassenaer in 1624 after seeing the tulip in the garden of one Dr. Adriaen Pauw, a director of the new East India Company. With limited specimens in existence at the time and most owned by Pauw, his refusal to sell any flowers, despite wildly escalating offers, is believed by some to have sparked the mania. By contrast to other flowers such as the coneflower or lotus, tulips have historically been capable of genetically reinventing themselves to suit changes in aesthetic values. In his 1597 herbal, John Gerard says of the tulip that “nature seems to plaie more with this flower, than with any other that I do know.” When in the Netherlands, beauty was defined by marbleized swirls of vivid contrasting colors, the petals of tulips were able to become "feathered" and "flamed." However, in the 19th century, when the English desired tulips for carpet bedding and massing, the tulips were able to once again accommodate this by evolving into “paint filled boxes with the brightest, fattest dabs of pure pigment.” This inherent mutability of the tulip even led the Ottoman Turks to believe that nature cherished this flower above all others. The Tulip is also viewed prominently in a number of the Major Arcana cards of the Oswald Wirth Tarot deck. Specifically: Arcanas Zero, One, Four, and Fifteen. Today, Tulip festivals are held around the world, for example in the Netherlands and Spalding, England. There is also a popular festival in Morges, Switzerland. Every spring, there are tulip festivals in North America, including the Tulip Time Festival in Holland, Michigan, the Skagit Valley Tulip Festival in Skagit Valley, Washington, the Tulip Time Festival in Orange City and Pella, Iowa, and the Canadian Tulip Festival in Ottawa, Ontario, Canada. Tulips are also popular in Australia and several festivals are held in September and October, during the Southern Hemisphere's spring. In Christianity, symbolize passion, belief and love. White tulips represent forgiveness while purple tulips represent royalty, both important aspects of Easter. ^ a b c d e f g h i j k Pollan, Michael (2002). The Botany of Desire. New York: Random House. p. 95. ISBN 0-375-76039-3. ^ a b King 2005, p. 164. ^ a b Tenenbaum 2003, p. 395. ^ a b c d e f g h i j k Christenhusz et al 2013. ^ a b c d e Grey-Wilson & Matthews 1980. ^ Straley & Utech 2003. ^ Christensen, L. P.; Kristiansen, K. (1999). "Isolation and quantification of tuliposides and tulipalins in tulips (Tulipa) by high-performance liquid chromatography". Contact Dermatitis. 40 (6): 300–9. doi:10.1111/j.1600-0536.1999.tb06080.x. PMID 10385332. ^ Sasseville, D (2009). "Dermatitis from plants of the new world". European Journal of Dermatology. 19 (5): 423–30. doi:10.1684/ejd.2009.0714. 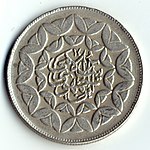 PMID 19487175. ^ "Tulip". ASPCA. Retrieved 2013-04-01. ^ "Tulip". Etymplogy Online. Retrieved July 24, 2017. ^ a b Marais 1984. ^ King 2005, p. 16. ^ a b Hall 1940. ^ Eker et al 2014. ^ Reyes, A. Leon; Prins, T. P.; van Empel, J.-P.; van Tuyl, J. M. (2005). "Differences in Epicuticular Wax Layer in Tulip Can Influence Resistance to Botrytis Tulipae". Acta Horticulturae. 673 (673): 457–46. doi:10.17660/ActaHortic.2005.673.59. ^ Westcott, Cynthia; Horst, R. Kenneth (1979). Westcott's Plant disease handbook. New York: Van Nostrand Reinhold. p. 709. ISBN 978-0-442-23543-7. ^ Rietveld, Patrick L.; Wilkinson, Clare (March 2000). "Low temperature sensing in tulip (Tulipa gesneriana L.) is mediated through an increased response to auxin". Journal of Experimental Botany. 51: 587–594. ^ Le Nard, M.; Biot, E. (1997). "MEASUREMENT OF COLOUR VARIATION OF TULIP FLOWERS GROWN IN DIFFERENT CONDITIONS". International Society for Horticultural Science. 10: 837–842. ^ Sims, John, ed. (1804). "Tulipa Breyntiana. Cape Tulip". Curtis's Botanical Magazine. Vol. 19. Drawn by Sydenham Edwards; Engraved by F. Sansom. T. Curtis. plate 717. ^ a b c d Mathew, Brian; Baytop, Turhan (1984). The Bulbous Plants of Turkey. Frome: Batsford. p. 100. ISBN 978-0713445176. ^ Baker, A. (1931). "The Cult of the Tulip in Turkey". Journal of the Royal Horticultural Society. LVI (1): 240ff. ^ Wilford, Richard. Tulips. Species and hybrids for the gardener. Portland: Timber Press. p. 53. ^ Hernández Bermejo, J. Esteban; García Sánchez, Expiración (2009). "Tulips: An Ornamental Crop in the Andalusian Middle Ages". Economic Botany. 63 (1): 60–66. doi:10.1007/s12231-008-9070-3. JSTOR 40390435. ^ Blunt, Wilfrid (1950). Tulipomania. Illustrated by Alexander Marshal. London: Penguin Books. p. 7. ^ Forster, E. S. (trans. et ed.) (1927). The Turkish Letters of Ogier Ghiselin de Busbecq. Oxford. ^ Pavord, Anna (2014). The Tulip: The Story of a Flower That Has Made Men Mad. London: Bloomsbury Publishing. pp. Introduction p.4. ISBN 9781408859032. ^ "How A Turkish Blossom Enflamed the Dutch Landscape". The New York Times. 2001-03-04. Retrieved 2012-03-14. ^ a b Christenhusz, Maarten J. M. (June 2013). "Tiptoe through the tulips – cultural history, molecular phylogenetics and classification of Tulipa (Liliaceae)". Botanical Journal of the Linnean Society. 172: 280–328. ^ "Tulipa spp". Floridata. Retrieved 2009-12-07. ^ Nishiuchi, Y. (1986). "Multiplication of Tulip Bulb by Tissue Culture in vitro". ISHS Acta Horticulturae. 177 (177): 279–284. doi:10.17660/ActaHortic.1986.177.40. ^ Brickell, Christopher; Zuk, Judith D. (1997). The American Horticultural Society A–Z encyclopedia of garden plants. New York, N.Y.: DK Pub. p. 1028. ISBN 978-0-7894-1943-9. ^ "Tulips". The Plant Expert. 2008-10-15. Retrieved 2012-03-14. ^ Pavord 1999, p. 352. ^ The Western Garden Book (Third ed.). Menlo Park, CA: Lane Magazine & Book Company. 1972. p. 448. ^ Eyster, William H. (1950). "The 'Species' Tulips". Organic Gardening. 16–17: 22. Retrieved 31 May 2017. ^ Bales, Suzanne F. (1992). Bulbs. Macmillan General Reference. p. 74. ISBN 9780671863920. ^ Fell, Derek (1990). The Easiest Flowers to Grow. Ortho Books. p. 97. ISBN 9780897212205. ^ Jauron, Richard. "Tulip Classes". Iowa State University. Retrieved 2012-03-14. ^ Pavord 1999, p. 31. ^ "TULIP FESTIVAL AMSTERDAM". Tulip Festival Amsterdam. Tulip Festival Amsterdam. Retrieved 30 March 2019. ^ "Easter Flowers". flowermeaning.com. Retrieved 2018-03-10. Botschantzeva, Z. P. (1982). Tulips: taxonomy, morphology, cytology, phytogeography and physiology. CRC Press. p. 120. ISBN 978-90-6191-029-9. Clusius, Carolus (1601). Rariorum plantarum historia: quae accesserint, proxima pagina docebit. Antwerp: Ioannem Moretum. Dash, Mike (1999). Tulipomania: The Story Of The World's Most Coveted Flower & The Extraordinary Passions It Aroused. London: Orion Publishing Group. ISBN 978-1-78022-057-4. Davis, PH, ed. (1984). Flora of Turkey and the East Aegean islands volume 8. Edinburgh University Press. ISBN 978-0852244944. Everett, Diana (2013). The Genus Tulipa: Tulips of the World. Kew Publishing. ISBN 978-1-84246-481-6. Goldgar, Anne (2007). Tulipmania: Money, Honor, and Knowledge in the Dutch Golden Age. Chicago: University of Chicago Press. ISBN 9780226301303. Retrieved 21 February 2015. Hall, A. Daniel (1940). The genus Tulipa. London: Royal Horticultural Society. King, Michael (2005). Gardening with Tulips. Portland, OR: Timber Press. ISBN 978-0-88192-744-3. Pavord, Anna (1999). The Tulip. London: Bloomsbury Publishing. ISBN 978-0-7475-4296-4. Pollan, Michael (2001). The Botany of Desire: A Plant's-Eye View of the World. New York: Random House. ISBN 9780375501296. Papiomitoglou, Vangelis (2006). Wild flowers of Greece. Mediterraneo Editions. ISBN 9789608227743. Tutin, T. G.; et al., eds. (1980). Flora Europaea. Volume 5, Alismataceae to Orchidaceae (monocotyledones). Cambridge, England: Cambridge University Press. ISBN 978-0521201087. Retrieved 4 October 2014. Tenenbaum, Frances, ed. (2003). Taylor's Encyclopedia of Garden Plants. Houghton Mifflin. ISBN 978-0-618-22644-3. Christenhusz, Maarten J.M. ; Govaerts, Rafaël; David, John C.; Hall, Tony; Borland, Katherine; Roberts, Penelope S.; Tuomisto, Anne; Buerki, Sven; Chase, Mark W.; Fay, Michael F. (2013). "Tiptoe through the tulips – cultural history, molecular phylogenetics and classification of Tulipa (Liliaceae)". Botanical Journal of the Linnean Society. 172 (3): 280–328. doi:10.1111/boj.12061. Clennett, John C. B.; Chase, Mark W.; Forest, Félix; Maurin, Olivier; Wilkin, Paul (December 2012). "Phylogenetic systematics of Erythronium (Liliaceae): morphological and molecular analyses". Botanical Journal of the Linnean Society. 170 (4): 504–528. doi:10.1111/j.1095-8339.2012.01302.x. Eker, İsmail; Babaç, Mehmet Tekin; Koyuncu, Mehmet (29 January 2014). "Revision of the genus Tulipa L. (Liliaceae) in Turkey". Phytotaxa. 157 (1): 001. doi:10.11646/phytotaxa.157.1.1. Harvey, John H. (1976). "Turkey as a Source of Garden Plants". Garden History. 4 (3): 24–42. doi:10.2307/1586521. JSTOR 1586521. Tan, Dun-Yan; Zhang, Zhen; Li, Xin-Rong; Hong De-Yuan, De-Yuan (2005). "Restoration of the genus Amana Honda (Liliaceae) based on a cladistic analysis of morphological characters" (PDF). Acta Phytotaxonomica Sinica (in Chinese). 43 (3): 262–270. doi:10.1360/aps040106 (inactive 2019-02-11). Retrieved 14 September 2015. Turktas, Mine; Metin, Özge Karakaş; Baştuğ, Berk; Ertuğrul, Fahriye; Saraç, Yasemin Izgi; Kaya, Erdal (July 2013). "Molecular phylogenetic analysis of Tulipa (Liliaceae) based on noncoding plastid and nuclear DNA sequences with an emphasis on Turkey". Botanical Journal of the Linnean Society. 172 (3): 270–279. doi:10.1111/boj.12040. Veldkamp, J. F.; Zonneveld, B. J. M. (2011). "The infrageneric nomenclature of Tulipa (Liliaceae)". Plant Systematics and Evolution. 298: 87–92. doi:10.1007/s00606-011-0525-0. Straley, Gerald B.; Utech, Frederick H. (2003). "Tulipa". Flora of North America Volume 26. p. 199. Retrieved 10 September 2014. "Tulipa". The Plant List (2013). Version 1.1. 2013. Retrieved 30 August 2017. "Tulipa". World Checklist of Selected Plant Families. Royal Botanic Gardens, Kew. Retrieved 30 August 2017. 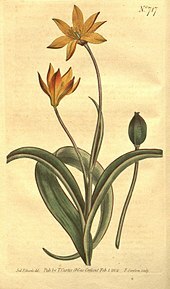 Wikimedia Commons has media related to Tulipa.